Grand Boulevard has been getting a lot of attention recently, with a wide assortment of stakeholders recognizing the importance of improving the boulevard. The concepts proposed thus far have created a high expectations but a definite lack of clarity about the most desirable and feasible path forward. A design that integrates the right balance of cars, buses, bikes, and people in a coherent and dynamic public space has the potential to be a true catalyst for Downtown. 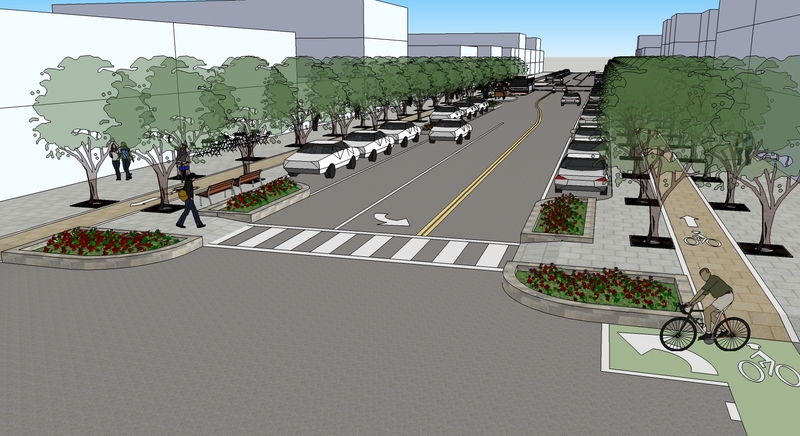 Efforts to create more complete streets in Downtown Kansas City took a big step forward recently when the City’s Parking and Transportation Commission and Downtown Council’s Infrastructure Committee supported a three lane configuration for Grand Boulevard. The concept for a three lane configuration on Grand originated as long ago as 2011 when the Parks Department developed its “Making Grand Grand” plan to make the street a signature urban boulevard. However, recent activity is a result of the City’s efforts to implement a Downtown bicycle loop, with Grand Boulevard serving as a central spine for Downtown bicycle infrastructure. Federal funding exists for restriping efforts (but not additional infrastructure), and the City is eager to move forward with visible progress. Since the first efforts to reimagine Grand Boulevard in 2011, a lot has happened. Community support of a complete street concept on Grand has grown, even as political support has remained lukewarm (tempered by the withdrawal of potential private partners). The construction of streetcar on Main Street has resulted in a road diet and reconfiguration of that major Downtown connector two blocks to the West. 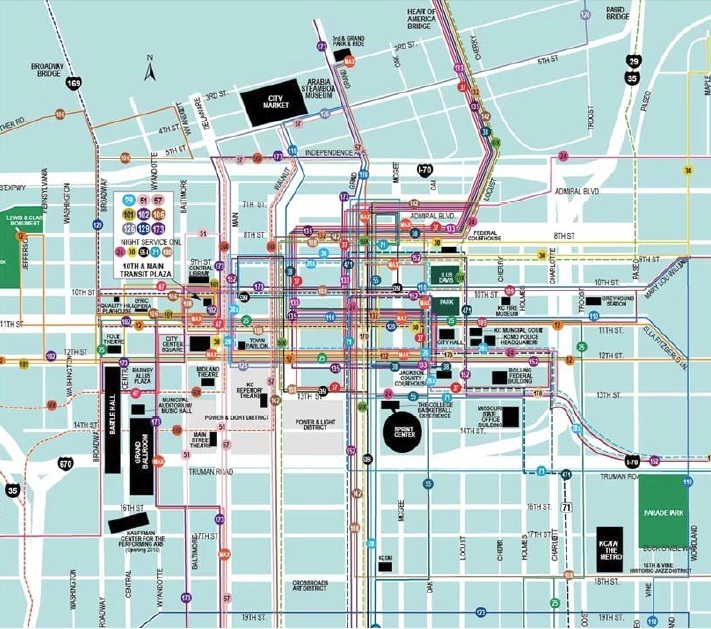 It has also impacted the KCATA’s analysis and reconfiguration of bus routes downtown, with Grand Boulevard emerging as one of the “transit emphasis corridors” for a streamlined and enhanced downtown transit system. As mentioned, the City secured funding for striping for a Downtown Bike Loop, and major redevelopment concepts are being explored at both ends of Grand: a mixed use, transit-oriented development concept at 3rd and Grand (the site of the City’s parking lot at the northeast corner), and a dramatic reconfiguration of Washington Square Park on the southern end (including substantial new development). The City has also developed a downtown traffic model with the capability to explore a variety of future transportation and development scenarios and used that to explore the reconfiguration of Grand Boulevard. This model demonstrated that a three lane configuration on Grand can maintain an adequate level of service. 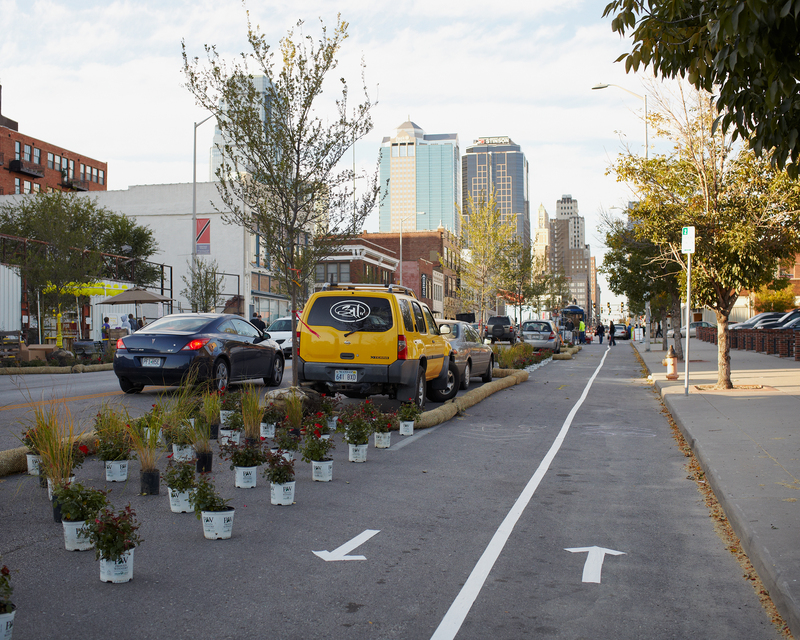 In 2012, Kansas City’s first Better Block event brought together community organizations to demonstrate the potential of a reconfigured Grand Boulevard. The result of all this activity has been intense interest in the future of Grand by a wide assortment of stakeholders, a general recognition of the importance of improving the boulevard, but a definite lack of clarity about the most desirable and feasible path forward. The Parks Department is focused on creating active and attractive destination street. KCATA is trying to understand how Grand can accommodate high frequency premium transit service. The Public Works Department is focused on bike lanes, however they might be squeezed in. With one hundred feet of right of way, Grand has plenty of space. Grand is better positioned than almost any other street in the City to have it all. The challenge is to find the right balance of cars, buses, bikes, and people. A design that succeeds in integrating these elements in a coherent and dynamic public space has the potential to be a true catalyst for Downtown. The recent direction of the City’s Parking and Transportation Commission has given new focus and urgency to addressing these challenges. The purpose of this piece is to identify the various design and functional considerations at play, and identify a concept for Grand Boulevard that meets everyone’s needs, and presents a clear path to implementation over time. It begins with a review of past and current proposals, and follows up with some specific ideas for how to move forward. The Making Grand Grand planning effort originated in 2011 as the most compelling project proposal to emerge from a loose partnership between the City’s Parks and Recreation Department, Bridging the Gap, and Mariner Kemper. 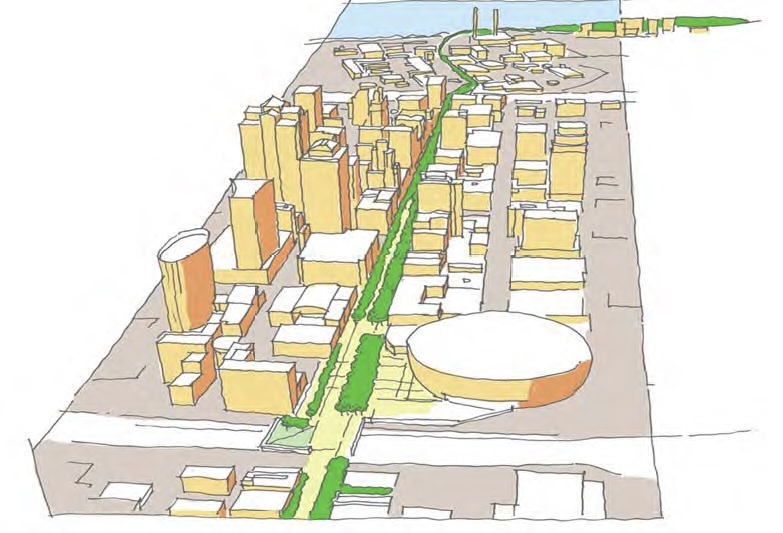 The plan begins with an affirmation of Grand Boulevard as an “image street” with a “civic image and heroic scale.” It describes a concept to connect the River Market, Downtown, Crossroads, and Crown Center with an iconic streetscape project that spurs new investment and activity on the spacious but underutilized corridor. The plan outlines a vision for Grand that is Complete, Green, and Livable. Toward that end, it focuses on creation of a multi-modal street that generously serves pedestrians, cyclists, transit, and motorists. It also recommends the creation of a dramatic green corridor that functions as sustainable infrastructure as well as a pedestrian amenity. The concept emphasizes opportunities to enhance activity and support development along the corridor. The emphasis on an active, green corridor seems fitting with its role as one of Kansas City’s boulevards. The Parks Department developed the “Making Grand Grand” plan in 2011 to make the street a signature urban boulevard. Perhaps the most important insight and direction provided by the Making Grand Grand plan was that with one hundred feet of right-of-way, Grand provided an incredible opportunity to accommodate whatever the City might imagine for it, and that so long as seventy feet and seven lanes were dedicated to moving and parking automobiles, that opportunity would never be realized. The Making Grand Grand plan recommended a road diet from five travel lanes to three, and used that extra space to incorporate a two-way cycle track as well as an expanded pedestrian realm. The on-street parking lanes were integrated with additional street trees, landscaping, and transit accommodations. 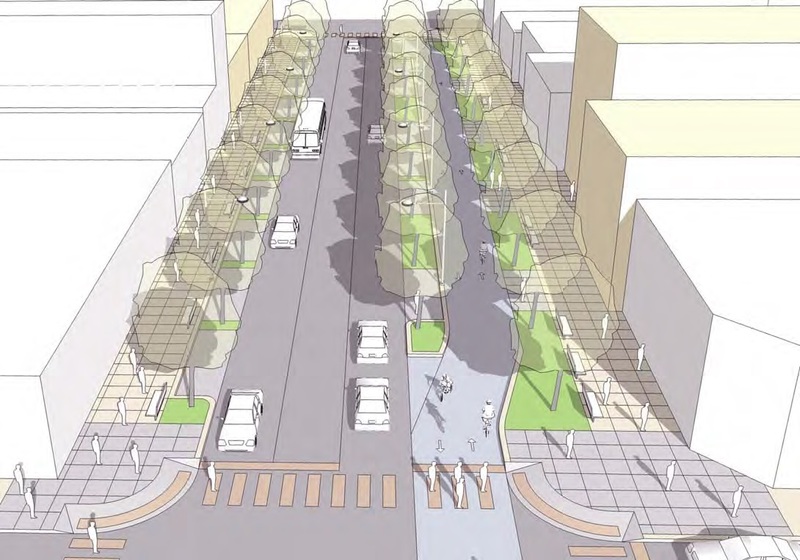 The concept proposed an asymmetrical layout for the Boulevard, in order to both incorporate and comfortably buffer the two way cycle track, but also to maximize and consolidate the space for people along the corridor (the soon-to-be-constructed road diet and streetscape improvements on 20th Street also utilize an asymmetrical layout). By creating a generous and continuous pedestrian zone, the Plan created a “linear park” environment that could accommodate a range of activities, programming, and amenities, in addition to its role of conveying pedestrians and cyclists. The Making Grand Grand concept also identified locations along Grand Boulevard where public spaces and amenities would expand to integrate with surrounding uses to create a more active and inviting environment and support a variety of functions. The Making Grand Grand Plan recommends a three lane configuration for Grand Boulevard to make room for a cycle track, street trees, landscaping, and expanded pedestrian areas. Making Grand Grand recommends an asymmetrical layout to consolidate pedestrian areas and facilitate a linear park environment. While the Making Grand Grand Plan did pose a number of design challenges, the biggest impediment to its progress emerged even before it was complete – the partnership between the City, Bridging the Gap, and Mariner Kemper to fund the project collapsed. This left a sour taste at City Hall, and no clear path for implementation. But the implementation challenges were also largely because the Making Grand Grand Plan required an all or nothing approach. A two way cycle track, asymmetrical layout, and other features cannot be implemented block by block, and requires the commitment and funding to construct the entire streetscape reconfiguration at the start. The project was intended to be a catalyst for new development, and so hanging the hopes of streetscape transformation on incremental development opportunities seemed to be putting the cart before the horse. With the potential of a public-private partnership to finance the entire project, the concept had great appeal, but when that disappeared, the concept stood on shaky ground. Because it required the transformation of the entire corridor simultaneously the Making Grand Grand plan faced implementation challenges. The KCATA has been working for several years on a Comprehensive Service Analysis to analyze and improve the quality and efficiency of its transit system. Downtown Kansas City represents the heart of the City’s transit system, and also its most complicated challenge. 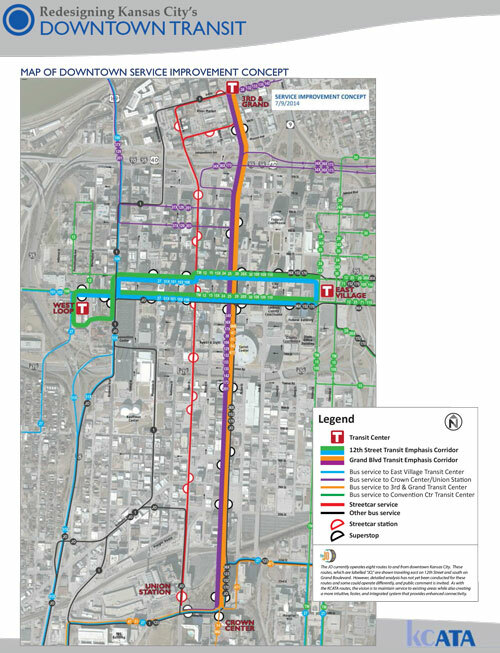 In July 2014, the KCATA presented a Downtown Transit Improvement Concept with the goals of providing simpler and more intuitive transit service downtown, providing service that is faster and more direct, creating easier connections and better customer facilities, and ensuring that there is strong integration between the bus and streetcar systems. At the most basic level, these efforts are geared toward improving the service for existing riders and attracting new riders. The current bus routes downtown are not particularly intuitive. Grand Boulevard figures prominently into the KCATA’s concept for transit service downtown. Instead of today’s incomprehensible maze of routes converging and circulating through Downtown, KCATA’s concept envisions the creation of an intersecting trunk route structure. With this approach, nearly all of the north-south routes through Downtown would align on Grand Boulevard, which creates the opportunity to significantly enhance the frequency and quality of transit service for Downtown in general, but Grand Boulevard in particular. The focus of transit service and facilities on Grand is by itself an important catalyst to activate the corridor, and if pursued in conjunction with other street improvements could be transformative. By reconfiguring north-south bus routes on Grand Boulevard, the KCATA will have a major impact not only on transit operations, but on the character and experience of the street. KCATA envisions the frequency of bus service on Grand at every one to two minutes. This type of service will change how people move through the corridor, and simply place a lot of buses on Grand. 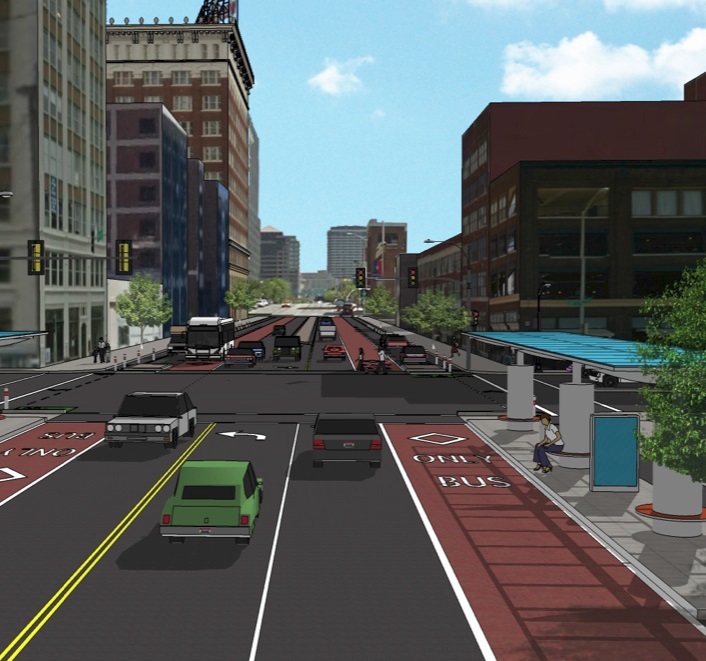 KCATA’s concept seeks to accommodate this new dynamic with dedicated bus lanes on Grand. These bus lanes are served by “superstops,” which are fewer in number but larger and with more amenities than current bus stops. The KCATA envisions even more substantial transit centers where Grand intersects with the streetcar and other key east/west transit-emphasis corridors. KCATA concepts illustrate how buffered bicycle lanes could be located behind bus land and on-street parking, preventing potential conflicts where buses would need to cross bike lanes at stops. KCATA’s preliminary concept for Grand includes dedicated bus lanes and bike facilities, but will it fit? While KCATA’s initial design vision for Grand is admittedly conceptual, its biggest challenge appears to be that the proposed facilities do not fit within the existing curb lines and would require major reconstruction. The concept identifies three traffic lanes and two bus lanes, which would require a minimum of fifty feet of right of way. Lanes for parking and bus facilities would require a minimum of sixteen feet. That leaves thirty four feet for sidewalks and bike lanes. The existing sidewalks are fifteen feet wide on either side, which would leave only four feet total for both bike lanes. To accommodate bike lanes in the proposed concept would require reconstructing the existing sidewalks, and actually result in less space for pedestrians that exists today. The second key challenge for this concept is related to the first, and that is that the concept does not reduce the space devoted to vehicles within the corridor, or provide additional space for pedestrians and non-mobility functions. The concept is designed for traffic and buses to move quickly. The crossings remain wide with fast-moving traffic, and the proposed signalization prioritizes bus operations over bikes and people. This is not an outrageous assumption for what may become a premium transit corridor, but it does compromise many of the community’s goals for the street. The provision of dedicated bus lanes certainly highlights the role of Grand as a transit street, and sends a message about the importance of transit in the corridor and Downtown in general, but its functional purpose is to ensure that buses operate efficiently free of traffic congestion. The challenge with this approach is that in its current configuration, Grand is one of the least congested streets Downtown, and does not produce traffic conditions that significantly impact bus travel times. In fact, the City’s Downtown Traffic Model demonstrated that even a three lane configuration on Grand with repositioned bus traffic still maintains an adequate level of service. With this in mind, dedicated bus lanes appear to be a solution for a problem that does not exist today and will not exist in the future. The City recently received federal funding for striping of a downtown bicycle loop through the Congestion Mitigation and Air Quality (CMAQ) program. 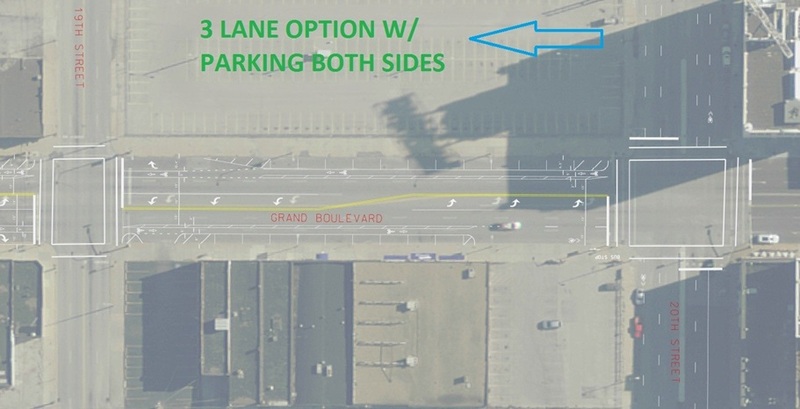 Over the past year, they have been working to development this concept that would connect bike lanes on Grand Boulevard to existing and proposed facilities Downtown. The Public Works department has stated that Grand Boulevard is a critical component of its broader plan for bicycle facilities downtown, and the availability of funding to finally implement physical bicycle facilities Downtown after so many years of discussions has provided a welcome sense of urgency for moving forward. In a blog post for the Downtown Neighborhood Association, James Rice does a great job breaking down the concept that the Public Works department is recommending. 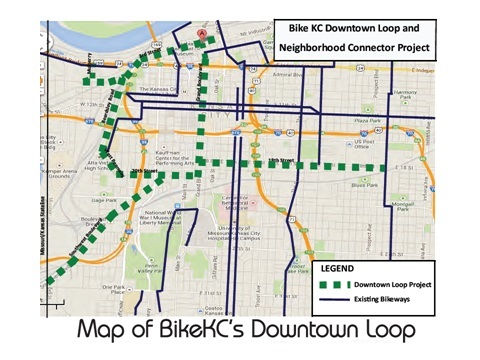 Like Making Grand Grand and the KCATA’s Transit Improvement Concept, the Public Works Downtown Bike Loop concept recommends a road diet and three lane configuration on Grand. The extra space is devoted to bike lanes located adjacent to traffic, and a small buffer is located between the proposed bike lanes and existing on-street parking. Some areas that are currently on-street parking would be striped is dedicated areas for bus stops. Curiously, even though existing traffic lanes on Grand on Boulevard are ten feet wide, the Public Works proposal identifies twelve foot traffic lanes with the stated purpose of more comfortably accommodating buses. The Public Works concept is limited in scope by its paint-only approach, but this approach is easy to implement in the immediate term, and provides the potential for adjustment and modification over time. The Public Works paint-only proposal for Grand includes buffered bike lanes between traffic and on-street parking, but no additional space or amenities for pedestrians. The Public Works concept faces challenges due to the constraints of its paint-only approach, but many of those challenges can be addressed through additional improvements or modifications over time. The most concerning aspect of the Public Works proposal is that it places the bike lanes adjacent to traffic rather than in a protected bike line that can be buffered by on-street parking and other amenities. This alignment creates a less comfortable and potentially less safe environment for cyclists. It also requires buses to cross bike facilities at each bus stop. With the high frequency of bus service expected on Grand Boulevard, this means that a bus will be crossing the bike lane every one to two minutes at every stop along the corridor. With so many potential conflicts the benefit of the bike lane is vastly diminished. The Public Works plan for bike lanes requires buses to cross bike facilities at each bus stop. It also increases the width of traffic lanes from ten feet to twelve feet. In addition to challenges with the design of bicycle facilities, the Public Works concept expands the width of traffic lanes from ten to twelve feet. Their stated rationale for this change is to create a more comfortable operating environment for buses, which it certainly will do. But with buses already operating in ten foot lanes on Grand, and with the prospect of buffering bus traffic on one side with a turn lane, and on the other with on-street parking, the need for the change seems unclear, particularly when the extra space can be put to better use. The wider lanes also create a design condition for higher traffic speeds on an already busy corridor, which again runs counter to the efforts to create a multi-modal corridor. If implemented, the Public Works proposal would devote the same amount of right of way to pedestrians as the current configuration. Each of the concepts described above brings something important to the future of Grand Boulevard. Virtually everyone exploring the future of Grand agrees that it needs to be an attractive destination street, that it needs to function as a premium transit corridor, and that it needs to be redesigned as a multi-modal street that includes bicycle facilities. Everyone also recognizes the challenges in moving from the current street configuration to the ultimate vision for a transformed corridor. The following hybrid concept attempts to bring together the best components from recent proposals in a design that thoughtfully balances all of the goals for Grand Boulevard. This hybrid concept also contemplates the challenges of implementation, illustrating how improvements can begin with a forward-looking paint-only approach that seamlessly transitions to interim improvements and infrastructure, and ultimately to a fully a redesigned streetscape. A hybrid approach for Grand can meet the needs of all users with a phased plan for implementation. This is part one of a series. Read “A Long Road for a Grand Boulevard – Part 2” here.